If you live in Cliftondale, a suburb of Atlanta, Georgia, contact Atlas Piers for quality foundation repair solutions. The constantly varying temperatures and recurring severe weather in the Atlanta area can cause several different foundation problems. Excess moisture from frequent rains can lead to erosion and foundation settlement, or increased hydrostatic pressure and foundation shifting or crack formation. Soil settlement, heaving, expanding, or shrinkage can also cause various different types of foundation failure, as the shifting soil can no longer adequately support the foundation above. 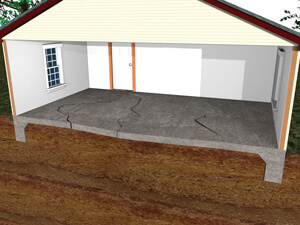 When foundation problems occur in your home, call the experts at Atlas Piers of Atlanta right away. If you see any of these problems in your home, contact a professional foundation repair contractor immediately. Here at Atlas, we offer a variety of repair solutions to take care of the problem in your home. To fix settling and sinking foundations, we use underpinning methods such as the installation of steel push piers or helical piers. These install deep into stable soils to lift and stabilize the above foundation; steel piers are driven into the ground, while helical piers are screwed in. Another solution for sinking foundations is pressure grouting. 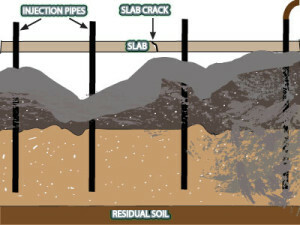 In this method, a cement based grout is pumped beneath the slab to fill spaces and lift the sinking foundation, closing slab cracks that may have formed from the settlement as it does so. Bowing and leaning basement walls and basement wall cracks can be repaired by installing carbon fiber strips. These strips are applied to the wall to add strength and stability and to straighten the wall and close cracks. Helical tiebacks can also be used to pull the walls back into place. These large, screw-like devices are installed horizontally to counteract the bowing of the wall and straighten out the foundation. We also offer several other foundation repair solutions: shoring, hardscaping, concrete repair, masonry repair, new construction piers, micro pull down piles. Wall encapsulation is a service that we offer to keep moisture from causing issues in your basement or crawlspace. To complete this process, a vapor barrier is installed along the interior surface area. This barrier seals out moisture vapor and prevents seepage through wall cracks. To find out more about how Atlas Piers can help you out, contact us right away.